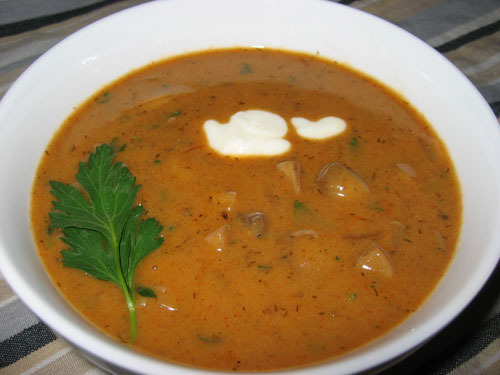 A Hungarian style mushroom soup seasoned with paprika, dill and sour cream. 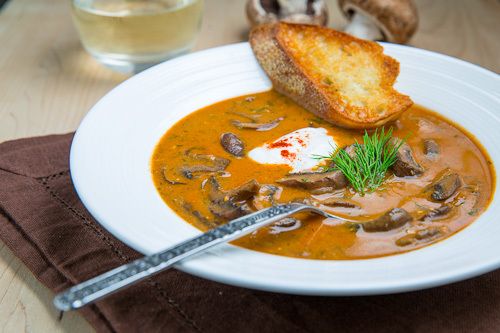 I first came across this recipe for a Hungarian mushroom soup a few years ago on All Recipes and as soon as I tried it, it became a favourite and a staple! 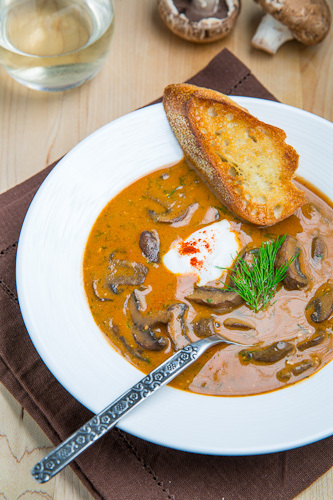 I am a big fan of mushrooms and you really cannot go wrong with a tasty paprika and sour cream sauce so combining them all in a soup is bound to be loads of tasty! The final component of the flavour profile for this soup is the dill which I always enjoy using and it makes this soup truly sublime! Not only is this soup all sorts of goodness but it is also easy to make and it comes together fairly quickly so it is certainly a candidate for a weeknight meal. The one thing that you want to pay attention to when making it is when you add the flour, you want to make sure that you cook it well before moving on to add the liquids so that you do not end up with the taste of raw flour in your soup. Serve garnished with sour cream, a touch of paprika and a bit of fresh dill. Melt the butter in a large sauce pan over medium heat, add the onions and mushrooms and cook until the mushrooms have released their liquids and it has evaporated, about 10-15 minutes. Season with salt, pepper mix in the sour cream, lemon juice and dill and remove from heat. Slow Cooker: Implement step 1 & 2, place everything except the sour cream, lemon and dill in the slow cooker and cook on low for 6-10 hours or high for 2-4 hours before adding the sour cream, lemon and dill. Given that I’m feeling sickly (just a cold coming on) this is perfect and just what the doctor in me ordered. Thanks. I made this and will be posting about it soon. I knew it would be good, but WOW! I think it might be my new favorite mushroom soup. It is apparent from your mushroom recipes that you truly appreciate the flavour and texture of this divine food. I will be trying more of your recipes in future. Very pleased to have found your blog. Thank you. I do not doubt this soup is tasty, but let me tell you a few things. I am hungarian (and also a food-blogger) and never happened to use soy sauce in any hungarian dish… we also do not put milk in this soup, but would double the sour cream. Dill is more Transsylvanian for me, but i would not argue on this now. Otherwise i like your blog a lot, i just could not help telling you some facts. My mother was born in what was Austria/Hungary at the time and I agree. A lot of sour cream and paprika was in use in our house, but NEVER soy sauce. She also used a lot of parsley, but I don’t particularly remember dill. I found a very similar recipe from the “Moosewood Lodge” cook-books. They don’t use soy sauce either, it’s tamari sauce. Small difference, either way, it’s my favorite recipe for soup, ever. They do a splash of lemon at the end, tons of dill and paprika (smoked or hot is very good!) and either beef or chicken stock work well. It’s made me search out other Hungarian recipies to see what I may be missing…. I had leftover pot roast, potatoes, and carrots and my hubby is not a fan of leftovers. Added some of the leftovers to this soup, delicious! Hy, nagyon tetszik a leves,Magyarországon ezt inkább őrölt szerecsendióval, vagy tárkonnyal készítik, gratulálok.A szójaszósz nem igazán hagyományos. Hiya. Right now I’m procrastinating, and stumbled upon this recipe. Hy [sic], I really admire the soup. In Hungary this would more likely be made with ground [mace or nutmeg, the word could refer to either], or tarragon. Congratulations. The soy sauce it not authentic. wolferiver: Thanks for the translation! I am going to have to try this with some different seasonings such as the caraway seeds or the nutmeg. Fantastic!!!! So tasty!!! My husband and I love this soup. It's a keeper. I'm going to make this soup for my dad when he comes for a visit next week. I'm posting a picture on my blog of this soup. Thanks for sharing your recipes. Most delicious! Whether it's an appetizer, dessert, or supper, I come here to find what I can make next. Looking at the dates, I see I've found this a bit late. But, I've just made it, and it was really very good. I put some bacon in, which gave a nice smokey flavour. Next time, if I use bacon, I'll leave out the soy sauce, as there was plenty of salt in the bacon. My husband, who comes from Hungarian stock, said that it needed a touch of chilli, which is something I'll add next time, but then he also ate 3 bowls of it! I just made this Hungarian mushroom, and it is a real keeper!!! Thanks so much! I just want to tell you how great this soup is! I made it last night and we all licked the bowls and the pot. Will try some of these soup recipes next week! This was delicious, Kevin! I loved the paprika and dill combo. Thanks for sharing! Anonymous: This is easily one of my favourite soups! Button or cremini work great but you could also use some wild mushrooms if you prefer. Thanks for the warning about the photo use! As much as I love your recipes and blog; I am Hungarian and this isn't Hungarian at all. Perhaps you could revise the title that it is "Hungarian-inspired" as I am insulted, slightly. Especially because you aren't acknowledging comments made by us Hungarians. This is the second time I have prepared this soup…..had a similar version in Black Mountain restaurant and loved it. This is just amazing…especially if you are vegan…going to take this soup with salad for a dinner and one person is vegan…substituted chicken stock for vegetable stock…still very very good. lile the recipe and will try it this weekend.How many does it serve? Anonymous: This recipe makes 2-4 servings. Am in the mood for some comfort food, so I think I shall try this tonight! If I wanted to make this in a crock pot while I run errands, would I simply add all the ingredients at once, save for parsley and sour cream? Stephanie: Yes this would work in the crockpot by simply putting everything but the parsley and sour cream in and cooking. Enjoy! Short and sweet … I can taste this. I have to do the vegan dairy but Mmmmmmm. 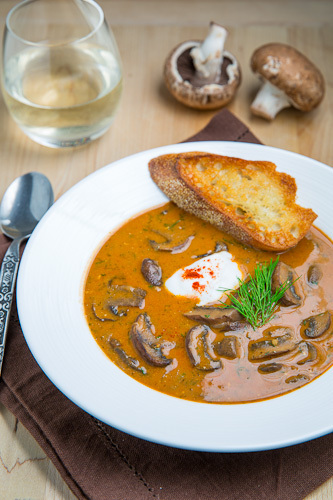 What a fabulous mushroom soup recipe! I'm originally from Hungary as well and your recipe sounds delicious, and I love you used dill. My mom used to make her mushroom soup with parsley instead of the dill. What a delightful soup and after perusing the ingredients I KNOW I'm going to like this. The crock pot idea sounds good too. This was a great soup! Delicious, my family really enjoyed it. I will make it again! Make this often. My husband is not a soup guy. He uses this as gravy for grilled pork chops, or pork roast. I think he's on to something! Discovered it was a fav when he took it upon himself to buy sliced mushrooms. (Awww!) I always take the leftovers for my lunch the next day. Can never seem to get enough of this recipe! To all the passionate arguers. Eat the soup. It will make you forget to split hairs. Mmmm, soup is so perfect for a chilly evening! This soup looks so warm and comforting. Thanks for sharing! Wow! This soup looks so hearty and comforting. Perfect for the still (arrrgh) chilly nights we're having. Made this for dinner tonight and it was delicious! Such a nice flavor. Made this last weekend and everyone loved it! Had it for lunch the next day and the flavor was even better…followed recipe exactly…will be making this again! I sustituted flour with processing a little part of the mushroom with paprika, dill and a little stock and I added a little corn starch (1-2 teaspoons). Use Hot paprika and a Tablespoon of tomato paste. This is one of my most favorite soups! I substitute cream cheese for the flour to make this gluten-free. wabashriver1: The cream cheese sounds good! Rice flour would also work. Just made this- it was very tasty, and not to mention fast! Made the Creamy Cabbage and Double Smoked Bacon Soup yesterday and this one today! Both turned out fantastic. Thank you for all of your great recipes! I made this yesterday. Thank you so much for posting this recipe. Delicious! So flavorful but easy to make. My husband wanted to lick the pot and asked if I would make more this week. I can't wait to try some of the other recipes you have shared. The lemon and dill brighten the flavor so much. Yum! Good soup. I am Ukrainian who lived at the border with Hungary, so adopted a lot of Hungarian dishes. Agree with the Hungarians' comments although I guess the paprika makes this soup Hungarian as well as sour cream base. One can also substitute mushrooms with potatoes and green beans. I made it from All Recipes too and it is amazing! And I don't really care for mushrooms, but this was delicious.